How to launder your linen. Always use a warm wash cycle in your washing machine. Try to ensure that the washing powder is as pure as possible. Many powders and liquids on the market today contain harsh bleaches and whiteners which, when used on natural fibres, will hasten wear, especially if the linens are overdryed in the dryer of left for too long to hang in the sunshine. A gentle soap powder with an occasional addition of a gentle whitener dissolved first in water, or placed in the designated dispenser of your machine, will help keep your linens in perfect condition. Never overdry in the tumble dryer. We recommend line drying if possible. If the dryer is used, take out the linens before they are completely dry, fold and air either indoors or outside. If line dried, minimal pressing is needed. Pillow cases always look best when pressed with a hot steam iron, but sheets and quilt covers, if folded neatly straight from the line or dryer, will look and feel great. Good quality cleaning products are a must for taking care for your Plane Tree Farm purchases. We’ve imported an exclusive range of products by The Laundress of New York. An eco-friendly line of detergent, fabric care, and products that take excellent care of you, the things you love, and the environment. Wash & Stain Bar 2oz. 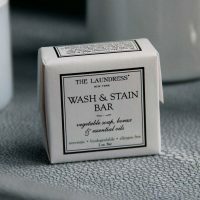 The Laundress Wash & Stain Bar was designed to reach those hard to reach areas, from tricky underarms to delicate straps, collars, cuffs, hems and more. We love using this product for removing stains on upholstery, hand washing and laundering on-the-go. We love to give our laundry and home an extra boost of clean. This nontoxic, biodegradable, and fragrance-free alternative to chlorine bleach works wonders to safely remove dirt, stains, and odors. 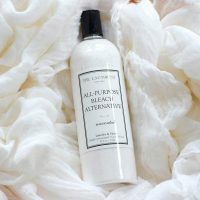 The Laundress Fabric Fresh is a non toxic product that has anti-bacterial properties to remove odour and freshen all areas. Fabric Fresh is safe to use on everything from upholstery, carpets, clothing, bed linens, closets and more.